Thrills, excitement, entertainment and fun all in one place? 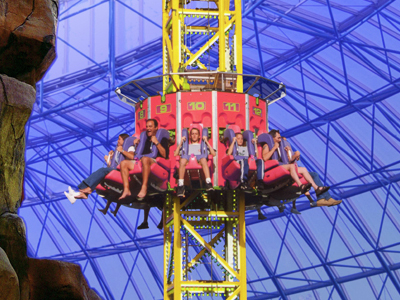 Adventuredome Theme Park at Circus Circus offers something entertaining the whole family can enjoy. Want a wild and exciting time for all members of the family? 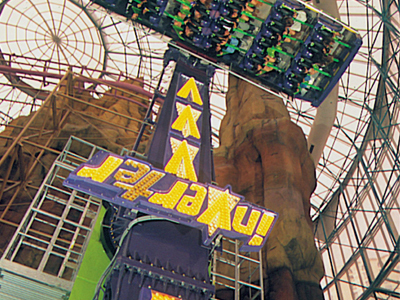 Well, Adventurdome Theme Park at Circus Circus will bring you lots of laughs and memories. 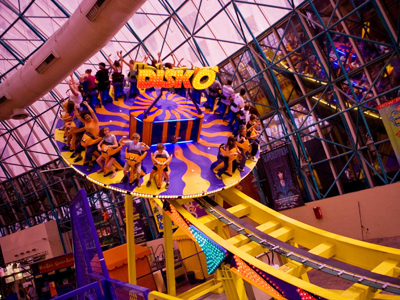 Choose from an assortment of 25 rides over 5 acres. Not a fan of rides? Well, no need to worry, Adventuredome offers free clown shows, an arcade, climbing wall and 4-D Spongebob Squarepants show. In the mood for a major thrill ride? El Loco is the newest coaster. 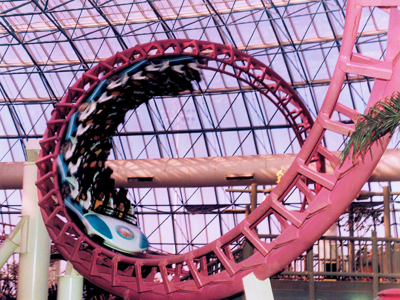 The Canyon Blaster is an indoor coaster that is full of loops and corkscrews for your enjoyment. Be sure to pay attention to height restrictions for each ride. There is a family section that is friendly for all ages. Keep the fun rolling all night with the Neon Disco Roller Rink. Every Friday and Saturday get GLOWING. 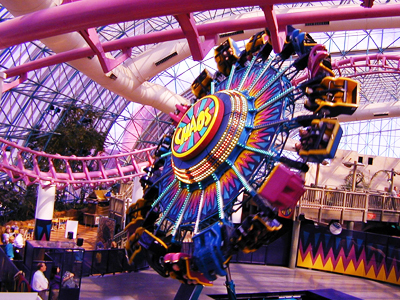 The Adventuredome takes on a new vibe with neon-inspired rides, attractions and games. Enjoy neon face-painting and t-shirts. Look for Fright Dome during the Halloween season! We had a good time here and thought they had a decent selection of rides for such a small park. It is a little pricey but what theme park isn?t? We would definitely go back. It was not crowded at all when we were there in May. We had a good time here. It is small and older but we thought they had a decent selection of rides. Kinda pricey but what theme park isn’t The El Loco was a lot of fun! It was not crowded at all when we were there. This park was pretty pricey. The kids had a good time, but it wasn’t anything super great. The place is rather old and out of date. We probably wouldn’t go back here again in the future. I take my kids here all the time. They love it, and so do I. There are so many fun rides and activities. Its so refreshing to find an escape from the heat! 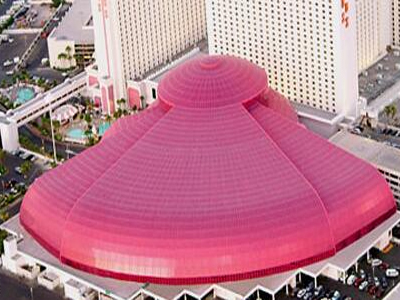 I liked the games at the adventuredome but the all day passes were too expensive. The rides were real fun, but I think you need to put a roller coaster without turns. I don’t know something like that hahaha i had a really funny experience in the restrooms (it’s not what you think). I was in the restroom haha and then the canyon blaster was going on and it felt like an earthquake but it was funny and kinda gross… But I Loved the adventuresome, especially, Disk’o’ and Sling Shot!? Goin’ for new year’s and stayin’ there?????? As much as we loved circus circus, this was really disappointing, it looked ran down and old. On the intercom in said ” biggest indoor theme park in North America ” witch was not true, we have been to Mall of America nickelodeon universe twice and it was about 4 times bigger than the adventuredome.. Very disappointing and a waste of time.. However mini golf was very fun! This seemed affordable, and the kids REALLLLLLY wanted to go. So of course suckered into going, it turned up rather disapointing. It was very run down, this place certainly could use a real overhaul and major renovations. The bathrooms were not clean, the entire place was very out-of-date and the rides were nothing special. I wound up spending more money just hoping that the kids would have a better time. Waiting in lines and feeling like a thick layer of dirt was on us…I couldnt wait to get back to the hotel. Not going to go here again, and suggest you spend your money taking the kids getting ice cream, or any other carnival would be just as good and probably cheaper, and most definately cleaner.